Why is this husband-and-wife winery named Donkey & Goat? Jared and Tracey Brandt of Donkey & Goat Winery. When you ask Jared Brandt why he and his wife, Tracey, named their Berkeley, Calif., winery after a donkey and a goat, he’ll tell you about their time in France. In the early 2000s, both were working in Northern California, thinking of a life beyond the technology sector. They talked about learning to make wine in nearby Sonoma, but were intrigued by the idea of going farther afield. “Tracey said, ‘Maybe you should go to France first and I’ll join you.’” The pair left their jobs and did just that. The couple traveled to France to intern with Eric Texier, in Charnay, northwest of Lyon. Both admired the artisanal pours of this independent, opinionated winegrower and looked forward to spending the 2002 growing season with him. It was a good fit. Neither intern spoke French, but each was determined to learn. “We said [to Texier], ‘If we don’t get it on the third try, switch to English,’ ” says Brandt. Their determination was keenly tested by Mother Nature. At one point, the sky dumped 3 feet of rain in just a few days. After the flood waters receded, Brandt accompanied Texier’s workers out to a facility that housed a heavy tank. “They said it was impossible to get it out, but I looked at it and said we could. We did it.” Brandt chuckles at the memory. 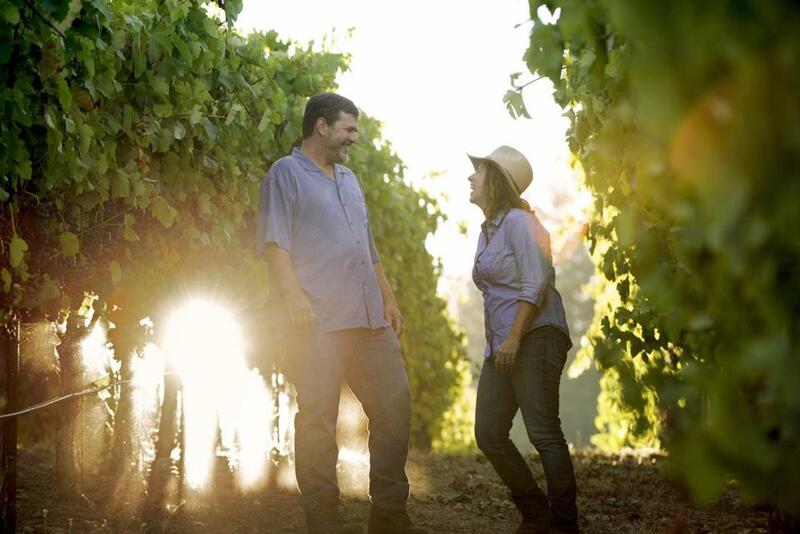 His headstrong, can-do ways tie into the story of how he and Tracey later named their winery. “A neighbor in France had a donkey and a goat,” says Brandt. “He trained the donkey to eat around the vines, but it would get really unfocused, so the farmer got a goat as its companion.” Goats, he explains, have a calming influence on fellow animals, even skittish racehorses. “I could be really stubborn,” he admits. “They said Tracey was my goat.” It was meant, of course, as a compliment. When asked how the year in France influences their winemaking today, Brandt doesn’t miss a beat. “On some core level, it dictates everything,” he says. Like their mentor, they eschew using commercial yeasts and work with a minimal amount of sulfur. Recently, when smokiness from nearby forest fires settled on red wine grapes, coating the skins with ashtray-like taint, they picked early and made rosé instead. “I’m inclined more to work with what I’ve got,” he says. Today, the husband-wife team makes an ever-changing array of bottles, from “pet-nats” (gentle sparklers) and orange wines to Rhone-style reds. A 2014 Donkey & Goat “Improbable” Chardonnay, with fruit sourced from a vineyard in El Dorado, uses wild yeast and neutral oak to coax out savory, stony flavors. Full of mouth-filling acidity, it’s a style of the malleable white grape that makes you think. Donkey & Goat Winery “Improbable” Chardonnay 2014 (around $30) is available at Charles Street Liquors, Beacon Hill, 617-523-5051; Streetcar Wine & Beer, Jamaica Plain, 617-522-6416.